Add some artistic flair to your next company team building or team outing event by hosting it here, at the Creative Arts Studio! As a hands-on pottery painting studio based in Royal Oak, Michigan, we showcase a wide palette of pottery painting, glass fusing, and mosaic projects. Additionally, we offer classes, lessons, and workshops in wheel throwing, pallet board painting, and canvas painting that make for the ideal corporate team building activity for your next staff outing. Our off-site team building functions have shown to be an effective way to forge professional friendships among coworkers. These creative workshops are fun and informative and are sure to be the talk of the office! While business meetups and networking events accomplish this too, it is the dynamic of working with one’s hands in a fun, team environment that positively impacts employees. Upon attending one of our interactive workshops, local companies in the Royal Oak, MI area have reconnected with their employees in impactful new ways. Completing projects together can help bolster creative, entrepreneurial synergy in the workplace among colleagues. It’s commonplace for the company suggestion box to be chocked full with new product ideas and/or process improvements once creativity becomes synonymous with the workplace culture. Here at our Royal Oak, Michigan studio, we’ll help spark a creative flame amongst your staff with one of our project based, teamwork inspired workshops. Why company team building events? Organizations often host team building events as they can help foster company culture and boost employee productivity. 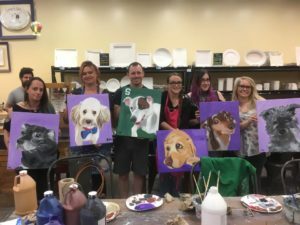 As coworkers get to know each other while working together on a variety of pottery painting, canvas painting, or pallet board painting projects, they tend to form strong, personal bonds that translate favorably into the professional arena. At the Creative Arts Studio, we present several project options that fit into most any team bonding or corporate teaming building session. Book your event at your venue and we can bring the fun to your company or choose to hold your event at our studio. Our projects make the perfect addition to company picnics and bring your child to work day events! Have something specific in mind? Let us create a custom designed package that meets the needs of your upcoming cultural training or team building program! Each, Creative Arts Studio service package can be customized to your team’s size, budget, and project needs. Whether it’s to celebrate your team exceeding their monthly K.P.I.’s, or to give a fellow team member a well deserved send off towards that new career path, they will appreciate the innovative gesture of a project-based, team building workshop that’s as much rewarding as it is rebuilding. As a premier, locally-owned, art studio and workshop in Royal Oak, Michigan, we at the Creative Arts Studio are proud of our community heritage. We’ve come to value the friendships we’ve forged with the businesses we’ve hosted over the years. It’s been equally rewarding for us to share in the experience and to create a creative experience for all to enjoy. This will be the work event you’ll be talking about for years! It can be set up right in your office. Each event can be customized to fit your business or meeting’s objective. This is perfect for company team building, corporate team building, company picnics, take-your-child-to-work-days, and cultural training events. There are tons of different projects to choose from with volume discounts for large groups. $75 travel fee + mileage over 5 miles for offsite events. Click here for information on projects and pricing.